Yet another tanker truck caught fire today and this time it’s creating chaos on Interstate 91 in Meriden, CT. 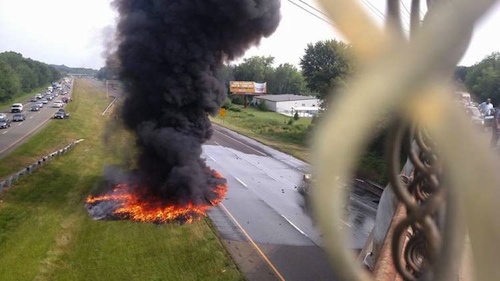 According to police reports, the accident occurred around 9:30 a.m. on Interstate 91 northbound between exits 15 and 16, and it’s believed that a popped tire caused the oil cargo tanker to roll over and catch fire. This is the third tanker truck fire in two weeks. 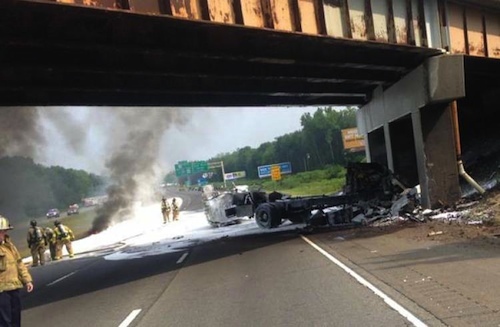 On July 1st a tanker truck explosion caused major damage in Columbus, Ohio and on July 8th a motorist died after crashing into a fuel tanker causing a horrific explosion in Alabama. The latest incident occurred Monday morning when a 2,800 gallon fuel tanker was driving northbound on I-91. Stephen Slaciunas had been on his way to work driving his Subaru in the same direction when he heard a “pop” and believed it was the tanker truck’s tire. The next thing he knew, he was watching helplessly as the tanker crashed into the Murdock Avenue bridge abutment between exits 16 and 17. “It hit the bridge and sliced the tanker right open. Fuel started spilling out, then it lit up,” said Slaciunas. Without enough time to steer himself clear of the fire, Slaciunas drove his Subaru right into the fuel and he could see the it flying in front of him and then quickly realized smoke was rising from under his feet in the car. His vehicle was engulfed in flames and he knew it was time jump ship. “I’m OK, that’s what counts,” Slaciunas said. Luckily, another quick thinking motorist stopped at the scene and immediately pulled the tanker truck driver out of his cab and away from the deadly flames. According to Fire Chief Ken Morgan, the truck driver was “pretty banged up” but his injuries were not life threatening and he was immediately taken to a nearby hospital to be treated. The tuck driver’s identity has not yet been revealed. In the meantime, emergency crews had a serious road situation to contend with. 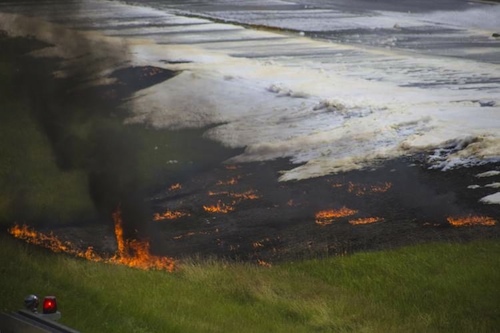 According to state police and the Department of Energy and Environmental Protection, the crash caused about 2,500 gallons of oil to spill onto the highway and a large amount of it could be seen on the highway and the median was fully engulfed in flames. The Fire crews were able to extinguish the vehicle fires shortly after arriving to the scene and then used foam to extinguish the fuel by about 10:30 a.m. The tanker truck was from Ron’s Family Fuel in Plantsville and there wasn’t much left of it by the end of the ordeal. The Subaru was also completely demolished by the flames and the Murdock Avenue Bridge is left with serious damage. The first priority is to reopen the highway after oil on the road is removed. Crews are also trying to determine if oil was released into nearby storm drains and they also plan to remove soil from the highway median after Monday evening rush hour traffic. 18.50 and hour to haul fuel. 20$ to haul boxes. For me, after 30 yes, not a single accident or ticket, these guys nowadays, nothing by a bunch of cowboys, same goes for livestock haulers.